Representatives of the three Donor States paid a visit to Slovenia last week to evaluate the progress made in implementing the EEA and Norwegian Financial Mechanisms together with the Government Office for Development and European Cohesion Policy as National Focal Point and Programme Operator for two programmes and other Slovenian Programme Operators. The Donors approved the 2016 Combined Strategic and Annual Report which will be available at www.norwaygrants.si shortly. Representatives of Donor States underlined Slovenia’s exemplary role, and congratulated the country for being a good and trustworthy partner boasting knowledge and experience from which Donor States may learn as well. Particularly, the Donor States were pleased to see enhanced bilateral cooperation with Slovenia, and expressed hope it would continue to grow in the future as well. The programmes and projects implemented in Slovenia were successful in a number of areas. After the annual meeting, the delegation visited two projects selected for site visit, i.e. CARS OUT! Project in the Sečovlje Salina Nature Park and Archaeology for All Project in the Simonov zaliv bay. Programmes running throughout period 2009-2104 are gradually closing in 2017. This is a perfect opportunity to take stock of what has been done, achieved and learned. Overall, the implemented projects spurred development and improved the quality of life in Slovenia in the relevant period. As many as 36 projects, which built on improving partnership, collaboration and pursued the principle of sustainability, were implemented under the EEA Financial Mechanism Programme and the Norwegian Financial Mechanism Programme. These projects made a significant contribution to advancement in the areas of public health, gender equality, biodiversity and ecosystem services, conservation and revitalisation of cultural and natural heritage and the environment. The NGO Fund, which supported 33 projects, targeted job creation, especially among young people, conservation of natural and cultural heritage, less violence and more equality and conservation of cultural and natural heritage. Thanks to the NGO Fund the local, proverbially overlooked projects, were given a chance – they ended up making big solutions to small problems. 52 mobility projects involving exchange of 184 students, 84 teachers and 227 members of higher education teaching and administrative staff received support under the Slovenian Scholarship Fund. The project activities contributed to strengthening mutual understanding and perception and appreciation of differences, while promoting cooperation. Also, the activities under the Scholarship Fund helped foster enhancement of human capital and bilateral relations, while bringing together the economies and societies of the relevant countries. The project results, outputs and outcomes will help shape and define things in the new programming period 2014-2021. 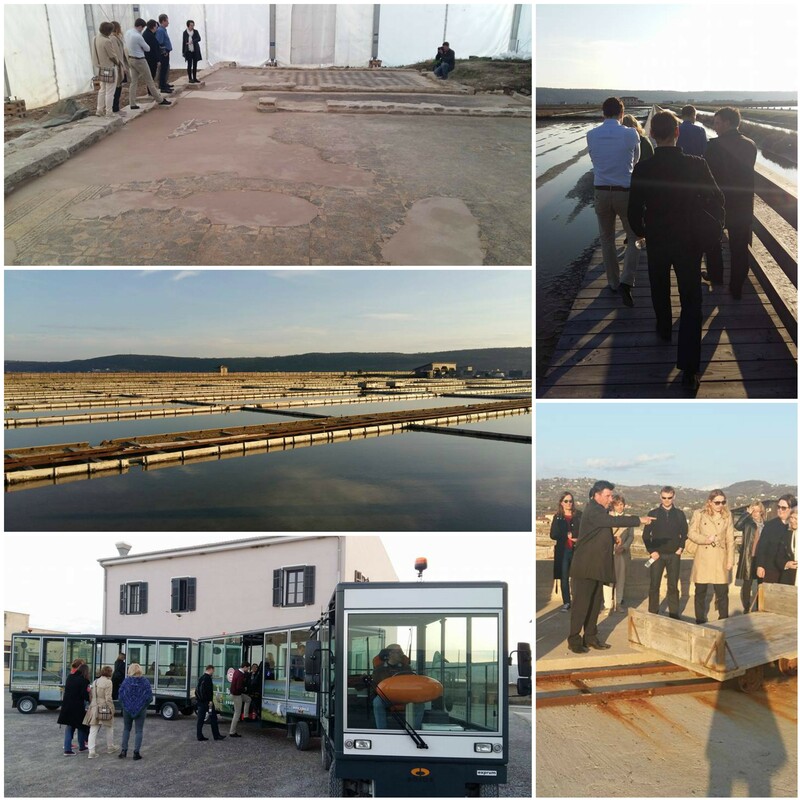 The two site visits took place in the Simonov zaliv bay and in the Sečovlje Salina Nature Park. The project Archaeology for All sought to improve accessibility to an archaeological site located in the Simonov zaliv bay – the site boasts most preserved and researched remains of a Roman seaside villa with a port in Slovenia and is easily accessible for visitors with special needs. It is also the first underwater park in Slovenia, which allows the visitors to experience a whole new aspect of sightseeing – the visitors get the chance to discover the submerged Roman remains through diving which is safe even for beginner divers. The CARS-OUT! project promoters presented the Sečovlje Salina Nature Park which is the first managed car-free nature park in Slovenia. The visitors park their cars at the entrance to explore the nature park on foot on newly created or repaired paths, by bikes or by hopping on an electric train. At the same time they can witness up close the traditional salt production method having a long-standing 700-year tradition, which nowadays produces more than 1,000 tons of salt per year.